According to reports today, "the Illinois church made famous in The Blues Brothers film has been badly damaged in a fire. Firefighters were forced to smash down the Pilgrim Baptist Church of South Chicago's stained glass windows to tackle the blaze last week. 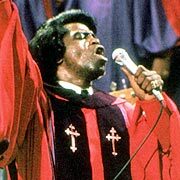 The place of worship gained fame after funk legend James Brown sang there during a scene in the hit 1980 movie". That's rather an understatement, to any of us who remember our first appreciation of the concept of vocation - when the blue light shines through the now charred stained glass of Pilgrim Baptist, and the messed-up saint John of Belushi sees that he finally has a purpose in life - to put the band back together and save the nuns' orphanage, thousands of young, lonely men discovered their own vocation too: to watch a lot of movies. For those of you who really love The Blues Brothers, donations can be made to the Pilgrim Baptist Church of South Chicago Fire Relief Fund, c/o Charter One Bank, 9200 S. Commercial, Chicago 60617.